On that first morning he pulled out a list of what he considered life changing development activities that he had learned over the years but had not put into practice. “One by one, I implemented each one,” he writes. He had decided to use one hour each morning and spend 10 minutes for each item on his list. Silence – as in meditation where he would concentrate on his breathing for 10 minutes. Affirmations – he wrote down his list of self-affirmations including the things he wanted to become and what he was going to do to change his life. Journaling – he had a journal but had not written in it for a long time, yet he found after writing a few things he was grateful for the way exercises her that motion creates emotion so drop down and did push-ups and insist for those 2 minutes of stopping by getting up one hour earlier as you normally do than you normally do and going through a routine it lifted his spirits. Exercise – he had heard that “motion creates emotion” so he dropped down and did push-ups then sit-ups for those 10 minutes without stopping. 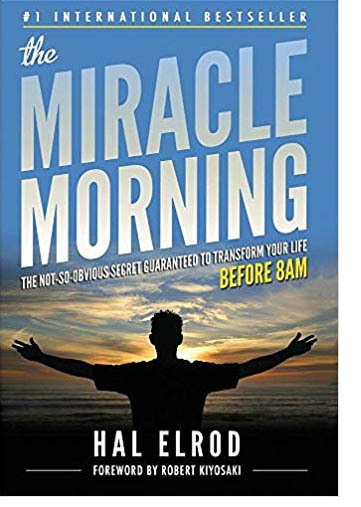 By getting up one hour earlier than you normally do and going through a routine, spending just 10 minutes on each item you set for yourself, you can change and enhance your life the way Hal Elrod has done. And Hal had some pretty huge setbacks when he was a young man. At age 20 he was hit head on by a drunk driver and was dead for 6 minutes. He suffered brain damage, 11 broken bones and was told that he would never walk again. He didn’t believe what he was being told and went on to defy the doctors, eventually running ultra-marathons, becoming a Hall of Fame Business achiever, and even recording as a hip-hop artist. If someone like that created and is using the “Miracle Morning” technique, you know that the method is certain to create success. It did work for him and I think it can work for anyone who is willing to set up the schedule and go after what is important to them.